I started thinking about my overall goal for 2015 several weeks ago. Last year I made the goal to "finish what I start." I revisited that particular blog post a while back and tried anxiously to reflect back on my year to see if I had indeed achieved my goal. Sadly, I realized that I had not achieved to the level I desired. I did finish a 5k in March that I had on my list of things to accomplish and I believe I became better at communicating in certain relationships. But overall, in several areas of my life, I failed miserably. So, this year I wanted to approach a bit differently. First, I wanted to have the support of my husband. I wanted to be in it together. Yes, we are always doing life together but I wanted to work on our goals together as a couple. We discussed what we wanted to work on in our individual lives first which actually lined up with one another. We both wanted to be sure we were using our time and finances wisely but we also wanted to make sure we were treating our bodies the way our Creator would desire - like the temples they are. The logical conclusion we came to was that we simply have to be intentional. It goes by too fast and once it's gone, that's it. There is no going back no matter how badly you wish you owned a working Tardis to transport you back in time. It is a precious commodity and, I'm sad to admit, too often I squander it by watching multiple episodes of Netflix shows, perusing my Facebook feed, and pinning new recipes, organizational tips, or DIY projects. My husband will tell you the same is with him - he plays video games, watches numerous how-to tutorials on YouTube, or mindlessly watches multiple episodes on Netflix with me. We are both guilty of allowing time to escape. So, we've decided to take back our time. We started studying the Bible together each night. He has read through the entire Word of God but I, shamefully, have not. I decided it's time. I read out loud and we stop and discuss different areas that need further clarification or on topics of personal interest. We do this after our little one is asleep and before we turn any Netflix on or anything else. Before the holidays, we also started a "No Screen Sunday" tradition. On Sundays, we have decided as a family to designate that day as purely a day to focus on God and family time. Other than text messages or phone calls with friends and family, our phones are mostly off limits, the TV stays off (at our house at least), and the computer is forbidden (unless necessary - as it is at the moment because I am finishing this blog after I finished my lesson plans). It has really made me realize how often I reach for my phone without thinking to look at facebook or instagram or pinterest. While none of those things are inherently "bad," they can become like idols if I'm not careful. And nothing and no one deserves that spot other than Jesus. Hubby and I have come a long long way in how we view our finances. We are no longer the "We want it, let's put it on credit" type of people. Been there. Done That. Got the debt to prove it, thank you very much. We are slowly but surely digging ourselves free from the pit that debt has had us in financially. I can finally see a light at the end of the proverbial debt-ridden tunnel. We still have a long way to go but we will get there with discipline and, you guessed it, being intentional. We are human and naturally we have desires for certain material things. We also know what giving into those means for us and so we desire now to be more intentional with the money we spend, not that there's much left after our bills anyway. Ha! A friend of mine taught me to filter possible expenses (wants) through the lens of "Will this somehow benefit the kingdom of God either through my personal relationship with Christ or the blessing of another person?" So that $5 I spent to let my kid run around at Fun Center yesterday I felt was filtered through that lens. I wanted to let him have fun and I wanted to enjoy watching him have fun rather than sitting at home while I "got something done" and he played video games or watched television. It was an investment in my child and it even allowed for some teachable moments. Whenever other children (who lack some supervision or discipline) are around, teachable moments (especially about grace) abound. Every year. This seems to be a resolution I make every year. And naturally, I'm frustrated that it has to be since I don't follow through. But if we want to keep in line with our goal to be intentional then we must also learn to be intentional with what we put into our bodies. The first 3 days of the new year found us experiencing a 3 day detox. Neither one of us had ever done anything quite like that before and it was an interesting experience. I felt the need to jump start the new year of eating healthy by ridding our bodies of the sugar we had gorged ourselves on throughout the holidays. I tell ya, drinking 3 meals a day for 3 days is not for the faint of heart. I learned some serious self control in those 3 days but I also realized the amount of food I consume when I am simply "bored" because oh, hey, I'm not being intentional with my time. You see, it's a cycle. I lost 6 pounds in those 3 days but I gained much more: motivation, discipline, will-power, desire, etc. Yes, I want to lose weight and I want to look good. But more than that, I want to be and feel healthy. I can do more for others and follow God's call better if I am healthy physically. So all in all, I guess you could say that my amazing other half and I are working toward intentional transformation in 2015 - financially, physically, and spiritually. And I think, they all go hand in hand. What about you? What are your goals for the year? 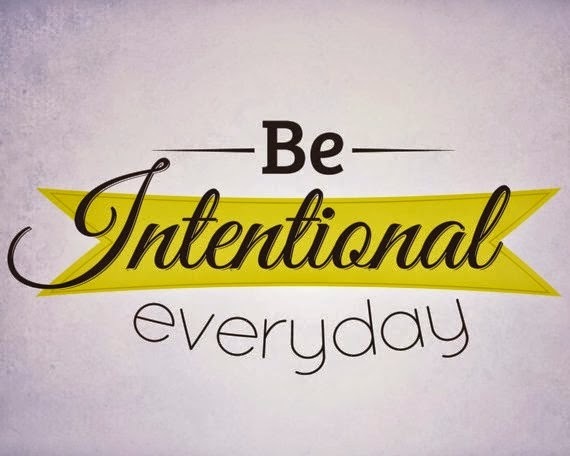 What sorts of things can you be intentional about? I'd love to hear from you!